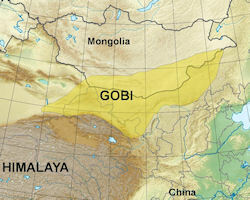 Inner Mongols lies to the south of the Gobi desert, while Outer is to the north of the Gobi Desert. During the 1750s, as a result of Manchu administrative policies, the first distinction was made between northern and southern Mongolia. The southern provinces -- Suiyuan, Chahar (or Qahar), and Jehol (or Rehol), known as Inner Mongolia--were virtually absorbed into China. The remainder of the region -- the northern provinces, which became known as Outer Mongolia -- was considered an "outside subordinate" by the Manchus, and it was largely ignored. After another 100 years, however, China again became alarmed by Russia's expansionist policy and colonial development in the regions north and west of Outer Mongolia. While the Mongols of present-day Inner Mongolia acknowledged Manchu suzerainty in 1634 with the defeat of Ligden Khaan (prior, in fact, to the establishment of the Qing dynasty), the Khalkha were not to submit until 1691. At this time, looking to defeat the Zuungars with whom they had contested for control of the steppe, the Khalkha, led by the ruling secular nobles and the Javzandamba Khutagt, submitted to the Manchus at Doloon Nuur in Inner Mongolia. The Manchu struggle against the Zuungar was to last until the 1750s. Mongols resident in contemporary Inner Mongolia first fell under the Manchu’s Qing rule in 1634 and, at the Assembly held in Dolon Lake in 1691, Khalkha Mongols accepted Qing rule. The Qing rulers organized new administration units known as banners all over Mongolia: there were 86 autonomous Khalkha banners and 49 banners in Inner Mongolia. Banners were divided into soums with 150 fixed households. Mongolia is a general term for the vast area of desert and grazing land extending from the Eighteen Provinces on the south to Siberia on the north, and from Manchuria on the east to Eussian Turkestan on the west. 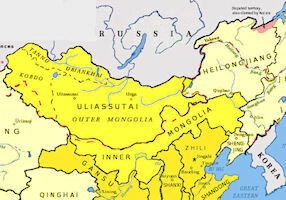 In this general sense Mongolia includes Outer and Inner Mongolia, Uliasutai, Hi, and Kokonor. 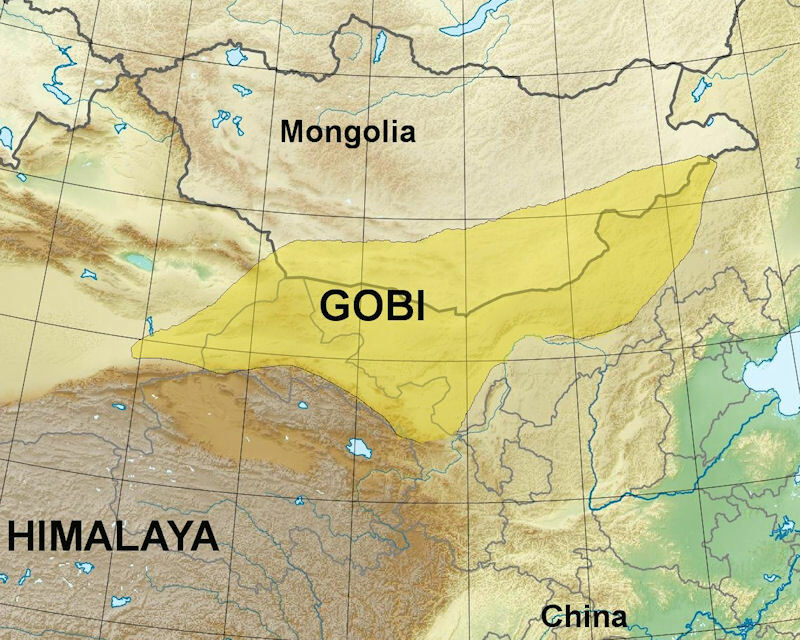 The Manchu Government recognized two Mongolias, Nei Meng-ku (Inner Inner and Outer Mongolia) and Wai Meng-ku (Outer Mongolia), which were divided roughly by a line Mongolia, drawn in a north-easterly direction through the center of the Gobi desert. While the Great Wall was the northern boundary of the Qin Empire, as early as the Han dynasty [206 BC-AD 220] much of Inner Mongolia was part of China. The Han dynasty never included more than a narrow strip of southern Outer Mongolia, while most sources report that Han rule never included all of Inner Mongolia, and never included any of Outer Mongolia. The Sui Dynasty occupied parts of Inner Mongolia after 604 AD. The Tang Dyansty [618-906] seems to have held both Inner and Outer Mongolia under its sway. The Ming Dynasty [1368-1644] appears initially to have held some part of Inner Mongolia, but by 1644 the Ming had retreated to the Great Wall. In 1636 Inner Mongolia was conquered by the Manchu Empire. By 1691 Outer Mongolia was incorporated into China by the Manchu Dynasty. Outer Mongolia, as the boundary region near Siberia is called, is more thinly populated than Inner Mongolia. Outer Mongolia is a prairie country, considerably above sea level, where the principal industry is cattle-raising. Inner Mongolia, or the portion lying adjacent to Chinese territory, is a fertile agricultural land, with a denser population and more active commerce. It has accepted more willingly than Outer Mongolia the political overlordship of China. Inner Mongolia, the region lying nearest to China, comprised territories inhabited by the tribes which first acknowledged the over-lordship of the Manchus. Inner Mongolia lies to the south and east, and extends over the plateau beyond the Hingan Mountains into the upper valleys of the Manchurian rivers, the Liao and the Sungari. By the end of the 19th Century it was peopled by the twenty-four tribes of the Inner Mongols, who were divided for administrative purposes into forty-nine Hoshun (whence a common designation of the Inner Forty-nine Mongols), by the eight Chakhar Banners (an imitation of the Manchu Banner Organization of Peking, and equally decadent), and the herdsmen of the Imperial Pastures. By the late 19th Century the Inner Mongols still retained the organization into six leagues adopted by the successors of Genghis Khan when all Asia lay beneath their sway. Inner Mongolia is bounded on the east by Chilin and Sheng-ching, on the south by the four provinces of Chihli, Shansi, Shensi, and Kansuh, on the west, by the extension of Kansuh, and on the north by Outer Mongolia and Hei-lung-chiang. The Great Wall is usually considered the southern boundary, but by the early 20th Century the jurisdiction of Chihli, Shansi, and Shensi extended to a considerable distance north of the wall. Parts of this division adjacent to the wall and to Manchuria were cultivated by Chinese, but the larger part was occupied by Mongols, who lived in tents and support themselves by their flocks and herds. Nearly all of Inner Mongolia was suitable for grazing. The Mongolias were excrescences in the Chinese system of government. The regular administration was confined to the Shih Pa Sheng (Eighteen Provinces of China Proper); Manchuria, known as the Tung San Sheng (Three East Provinces) was in normal times under a separate organization of its own, officered almost wholly by Manchus; and the rest of the huge fabric — Thibet, Hi, Uliasutai, Kobdo, Kokonor, and the Mongolias — was held together by residents of sorts, chiefly Manchus of high rank, who were under the control of a Board at Peking, called the Li Fan Yuan (Court for the Regulation of Feudatories). The Chino-Japanese War, which revealed the weakness of the Chinese Empire to the world, was followed by a furious scramble for spoils, in which Japan and all the great European powers except Italy participated. Russia pushed forward in North Manchuria and Outer Mongolia, Japan in Manchuria and Inner Mongolia, Germany in Shantung, Great Britain in Tibet and the Yangtze Valley, France in the three southern provinces of Kwangtung, Kwangsi and Yunnan. Shortly after the outbreak of the Chinese Revolution, Outer Mongolia declared its independence and proclaimed the Hutuktu (Living Buddha) as Emperor. Its autonomy was recognised by the Russian Government, and on November 3, 1912, a Convention and a Protocol were signed at Urga by the Russian Envoy and the Cabinet of the Hutuktu. By this Convention the Russian Government undertook to assist Mongolia to maintain the autonomous regime she had established, to support her right to have a national army, and to admit neither the presence of Chinese troops on her soil nor the colonization by the Chinese of her territory. The Mongolian Sovereign and Government will assure to Russian subjects and Russian commerce as in the past the full enjoyment of their rights and privileges as enumerated in the Protocol, and it is clearly understood that no other foreign subjects in Mongolia shall be granted fuller rights than those accorded to Russian subjects. By 1913, the knotty point of the geographical definition of autonomous Mongolia, as well as other important matters, remained for discussion at the three-cornered conference which it has been decided to hold forthwith at Kiachta. While China appeared prepared to accept the 'fait accompli' in Mongolia, there still remained a wide gulf between Russian and Chinese ideas of the regions to which the new arrangement applied, and long outdrawn negotiations at Kiachta were expected. On November 5, 1913, after prolonged negotiations, an agreement was reached in Peking between Russia and China, whereby Russia recognised Innder Mongolia as part of Chinese Territory under Chinese suzerainty, and China recognised the autonomy of Outer Mongolia. Both countries agreed not to send troops to Outer Mongolia other than as consular or official guards, and not to colonise its territory. 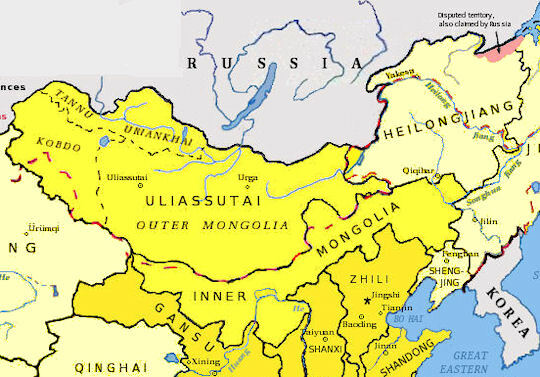 Autonomous Outer Mongolia was denned as the territory formerly under the jurisdiction of the Chinese authorities at Kobdo, Uliasutai and Urga. Frontiers and other questions were settled at a tripartite conference between Mongolians, Chinese, and Russians, which were concluded in June, 1915.